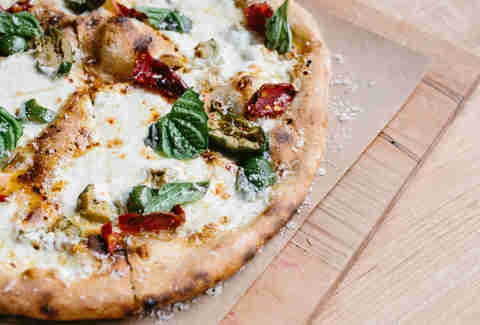 W hen people think of Charleston food, pizza doesn’t tend to make the list. That said, there are actually a ton of great pizza joints in the Holy City worth checking out the next time you get a craving for that cheesy, doughy goodness. After all, is it really a party if there’s no pizza involved? Monza is an Italian racing-themed restaurant that specializes in gourmet Neapolitan-style brick oven pizzas. Like DeSano, it also has many of its ingredients and equipment imported from Italy, but it also has a focus on sourcing ingredients and flavors from local suppliers as well. 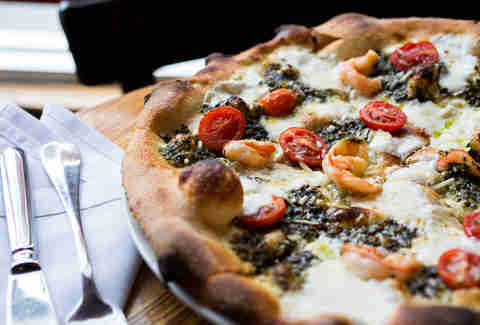 Pro tip: try the Vanwall Special made with pesto, mozzarella, shrimp, and seasonal tomatoes. At 2am, you’ll see a line of not-so-sober college students forming on Market St with people waiting to get one of these giant slices of New York-style pizza to eat as they stumble home. We’re talking super-thin crust, lots of cheese, and lots of grease on slices that require two hands to hold. It's open during the day, too, so you can get a cheap slice whenever the mood strikes. D’als (as it is lovingly referred to) is a neighborhood favorite, located just south of the crosstown in the heart of Elliotborough Downtown. The menu is filled with unique and creative options for hand-tossed pizzas, calzones, salads, and caljoes (panini sandwich). You can also find its frozen pizzas around town at places like Bull Street Gourmet & Market for a take & bake option. Our favorite: the Chauncinator. If you’re a fan of pizzas with a lot of wacky toppings and flavor combinations, and thicker crust, then Paisano’s is definitely the pizza for you. If you’re feeling adventurous, try the Speedy Gonzalez, topped with cheddar cheese, ground beef, jalapeños, onions, tomatoes, and taco seasoning, or the Colbert, with a blue cheese base topped with chicken (grilled or fried), blue cheese crumble, and hot sauce. For a more classic pizza, opt for the Zeus, topped with basil, spinach, tomatoes, olives, and feta cheese. EVO (short for Extra Virgin Oven) is constantly packed with pizza fanatics and die-hard fans of its wood-fired pizzas, sandwiches, and baked goods. It's also a bakery, so you can bet that the dough and pizza crust are some of the best you’ll ever have. The best pizza on the menu is the Pork Trifecta (seriously, it’s got a cult following), with red sauce, house-made sausage, pepperoni, bacon, mozzarella, and Parmigiano-Reggiano. If you prefer your pizzas on the fancy side, then Crust is where you should go to wet your whistle. Its wood-fired artisan pizzas are made with fresh and local ingredients, and are unlike any other pizza you’ll find in Charleston. Because it sources many of its ingredients locally, it always has a few daily pizza specials, so each trip to Crust can feel like the first time. Our favorite menu standard is the butternut squash pizza with roasted squash, mushrooms, caramelized onion, goat cheese, mozzarella, arugula, and truffle oil. Located in a pretty desolate part of Dorchester Rd inside a shiny old diner lies the distinctly hidden treasure that is Charleston House of Pizza (aka CHOP). 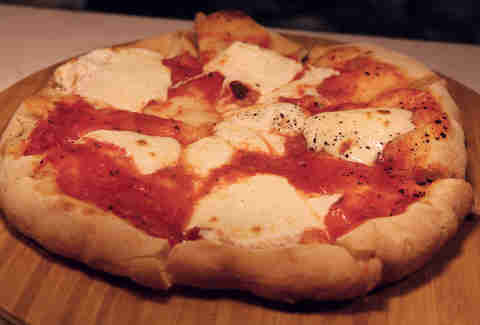 The sauce is a little on the sweeter side, and the pies are loaded with mozzarella & cheddar cheeses. It isn't fancy, and it doesn’t pretend to be. The menu is simple, with only five different specialty pies, including the veggie pizza, which is loaded with peppers, onions, broccoli, olives, and tomatoes that even a carnivore is sure to enjoy. 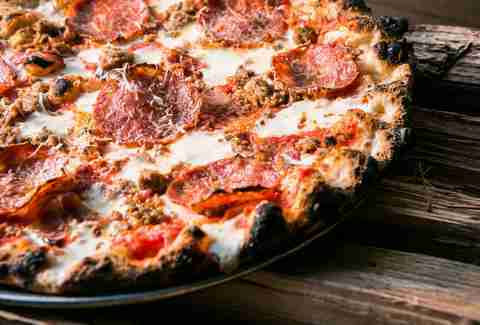 Indaco’s wood-fired pizzas are exquisite, with a crust that’s thin, but not too thin, so it’s hearty enough to support the upscale and creative mix of toppings. Favorites include the Brussels sprouts pizza topped with honeycrisp apples, Brussels sprouts, ricotta, dark honey, and pancetta, or the classic Cerignola olives pie with mozzarella, Calabrian chili, basil, parmesan, and olives. 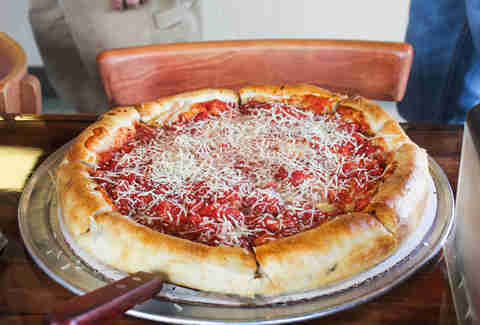 Located in an unassuming shopping center in Mount Pleasant, La Pizzeria is the definition of a hidden gem. Seriously, if you blink, you might drive right on by. Specializing in Northern Italian-style cuisine, La Pizzeria brings a little taste of Boston’s famed North End to Mount Pleasant. Our favorite is the prosciutto pizza, layered simply with prosciutto, spinach, and Parmigiano cheese. Famulari’s is a locally owned chain that’s beloved by locals and tourists alike. It’s one of the only places in Charleston that offers a Chicago-style deep dish pizza (for when you have a deep dish appetite), and it really does the Windy City justice. The newest location on James Island is a brewpub, which features a number of Famulari’s house-brewed drafts that pair perfectly with a slice of pizza -- you can also get brunch at the brewpub, with options like fruit-filled calzones, beignets, and deep dish frittatas. 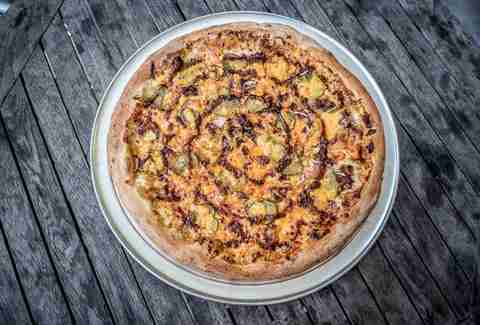 Fiore’s in Johns Island offers a number of specialty toppings for its oven-baked pizzas and grinders. But its true claim to fame is the free (and tasty) crust seasonings. Those of you who usually discard the crust for being tasteless should prepare to have your world turned upside-down. Choose from butter, garlic herb, Cajun, cheese, ranch, or sesame, and start treating your crust with the respect it deserves. For a place that only does carry-out pizzas, Luke’s puts a lot of effort into making a quality pie. Owner Luke Davis worked at EVO and Monza before he struck out on his own, and while the shop might be small (the space is only 450sqft, hence carry-out only), the handmade pizzas are big on flavor. You can build your own using one of the handcrafted bases like crushed tomato or creamy ricotta, or try one of the weekly specials advertised on Facebook. Be sure to stop by early, though, as the place closes once it sells out of dough! 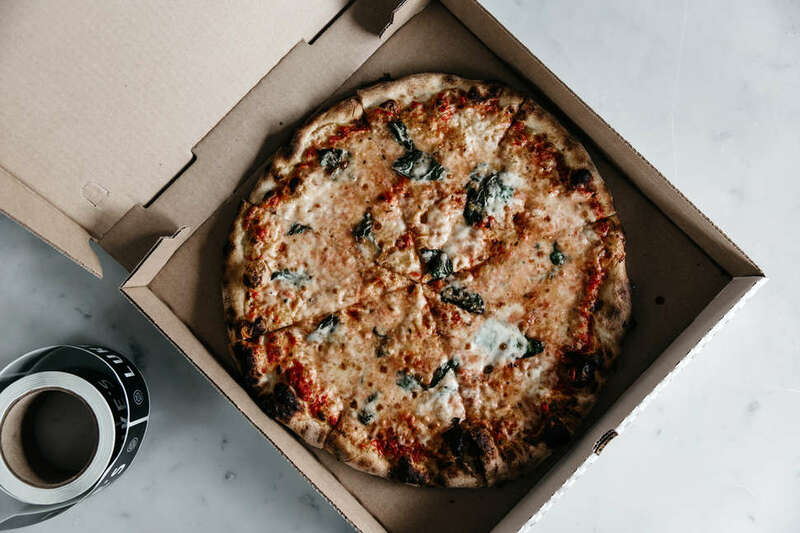 A long day of shopping tends to work up an appetite, and Community Pizza House, which serves creative combinations to satisfy any craving, is conveniently located within the Tanger shopping center in North Charleston. Favorites include the potato & bacon (with roasted garlic oil, smoked provolone, fingerling potato, applewood smoked bacon, sweet onion, and a farm egg), and the chicken & pesto (fresh basil pesto, fresh mozzarella, roasted natural chicken breast, sweet & sour peppers, whipped ricotta, grated Parmesan). And, since pizza tastes best with beer, CPH has a healthy draft and bottles list, full of local and national favorites. 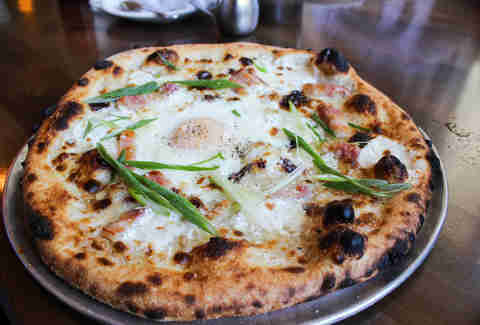 Obstinate Daughter is known for its fantastic brunch and French, Italian, and Spanish-influenced offerings, but it also had the brilliant idea to serve pizza for breakfast (fact: If you add an egg to anything, it automatically makes it breakfast food). One of our favorites (at breakfast or otherwise) is the Old Danger topped with pancetta, mozzarella, white sauce, farm egg, scallion, black pepper, and Parmesan. It kind of tastes like spaghetti carbonara on pizza. Sister restaurant to local favorites Langdon’s and Opal, Wood & Grain premiered in the Shelmore Shopping Center in Mount Pleasant earlier this year to a fully packed dining room, and hasn’t slowed down since then. With only eight pizzas on the menu, the offerings are simple but packed with flavor; chef Patrick Owens has a flair for marrying atmosphere and taste, and his pies are just as beautiful to look at as they are to eat. 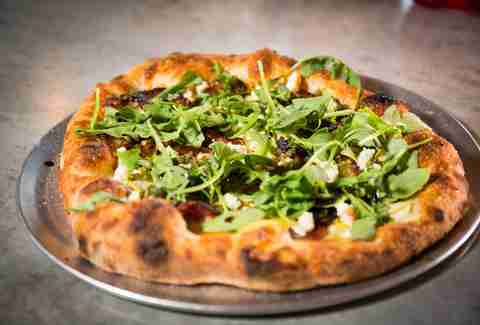 We recommend the Salsiccia pizza, which comes topped with tomato, fennel sausage, garlicky greens, and ricotta. 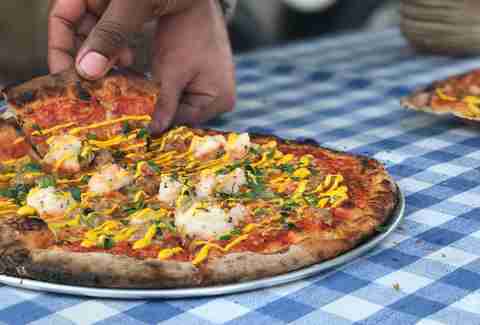 One of the newest ventures to hit the Charleston culinary scene is the Dough Boyz food truck, which was quick to establish its pies as some of the greatest in the Holy City. When one of its chefs studied at ALMA in Italy and under Mario Batali, you expect great things, and Dough Boyz definitely does not disappoint; you can find them slinging pies at pop-ups at various bars and restaurants in Charleston, including Bar Mash, Elliotborough Mini Bar, and Cooper River Brewing. The menu varies but has been known to features wild creations -- like a paella pizza with house-made chorizo, clams, mussels, shrimp, and saffron aioli -- alongside more traditional offerings, like margherita. The team at GlowFisch Hospitality had already successfully cracked the code to burgers and sandwiches in Charleston at their other popular restaurants, Five Loaves and Sesame Burger, so they decided to take their talent to the pizza oven. 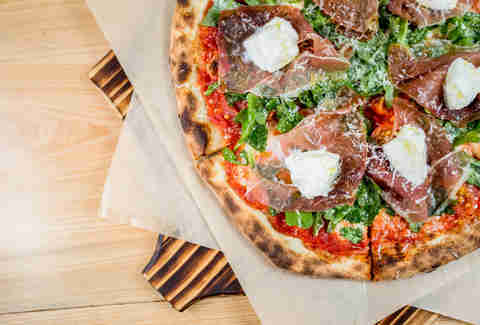 Ember combines “Neapolitan style pizza and California inspiration” at their Belle Hall restaurant, offering a number of wood-fired options, like sandwiches, veggies, and (of course) pizza. Be sure to save room for dessert when you visit Ember, because the Nutella S’mores Pizza (with toasted marshmallows, almonds, caramel sauce, and powdered sugar) is no joke. Any concept that took over the old Butcher & Bee space was likely to face some harsh criticism, but Juliet has premiered with the rare and coveted 5-star status on Yelp. 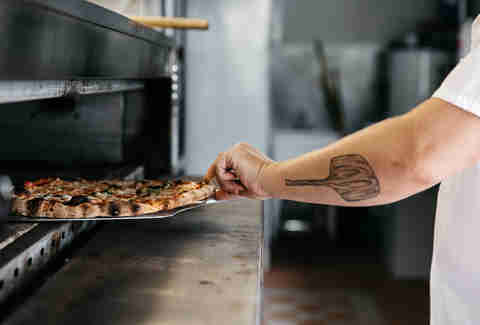 The pizzas are hand-tossed, with just the perfect amount of Neapolitan-style char on the crust. Each of the eight pies is perfectly crafted, like a piece of art -- our favorite is the Prosciutto & Arugula, which is topped with burrata for a harmonious balance of textures and flavors. If you’ve ever been in the mood for a slice of pizza as long as your torso, Benny Palmetto’s is the place to satisfy such a craving. The New York-style slices here are a whopping 14-inches long (longer than some human babies), and require two paper plates side-by-side in order to fit. In addition to its massive slices, Benny Palmetto’s also offers whole 28-inch pies for when you need to feed a small army, with all the usual toppings. Pair that with $1 PBRs all day, every day, and you’ve found pizza paradise. Sydney Gallimore is a food writer from Charleston who's eaten more pizza than she cares to admit (but there's always room for one more slice). Follow her at @Sydney_Inc.